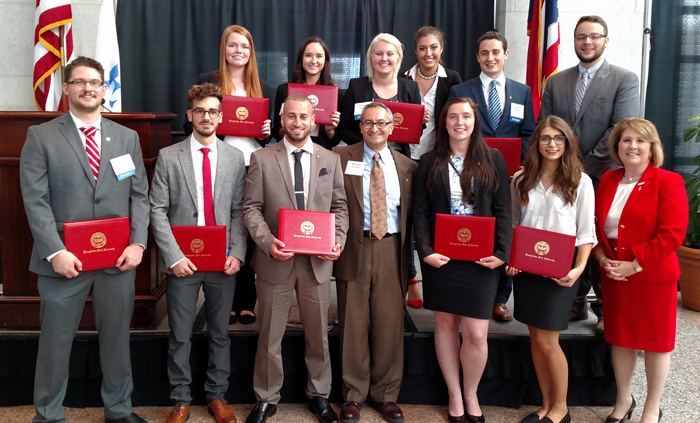 Front row, from the left, are Michael Steensen; Fabio Basil; Fadi Chammas; Mousa Kassis, director of the WCBA Ohio Export Internship Program; Briana Scott; Stephanie Wood; and Betty Jo Licata, Dean, YSU Williamson College of Business Administration. Back row from the left, Tiffani Pike, Yana Flider, Connie Buck, Nichole DeSantis, Daniel Belinky, and Michael Osborn. Eleven business students, nine from Youngstown State University and two from the University of Akron, recently completed full-time paid exporting internships as a part of the Ohio Export Internship Program. The program is offered through the YSU Williamson College of Business Administration in partnership with the Ohio Development Services Agency and Ohio State University Fisher College of Business. The students were honored at a special ceremony at the Ohio Statehouse in Columbus. Students were welcomed by David Goodman, director, and Daryl Hennesey, assistant chief, business service division, of the Ohio Development Services Agency. Other speakers included YSU President Jim Tressel and WCBA Dean, Betty Jo Licata. Mousa Kassis, director of the WCBA Ohio Export Internship Program, presented each of the students. * Daniel Belinky, a senior business economics major with Certificate in Enterprise Resource Planning, worked with MakerGear LLC, a 3D Printer manufacturer in Beachwood, Ohio. The factory’s machines are built locally and shipped globally. * Connie Buck, a senior marketing management major, worked as an intern with Haltec Corporation in Salem, Ohio. Haltec is the World’s leading supplier of tire management and inflation solutions. Connie’s internship with Haltec has been extended through the fall semester. * Fadi Chammas, a senior international business major, worked at Quaker City Castings (Korff Holdings, LLC), Salem, Ohio. They are a no-bake sand foundry that produces a wide variety of iron castings and steel castings for various industrial applications. * Nichole DeSantis, a senior marketing management major and a minor in international business, was employed with ARS Recycling Systems, LLC, in Lowellville, Ohio. ARS Recycling Systems is an industry leader in the design and manufacture of Abrasive Recycling Machines, Dust Collectors and Rapid Deployment℠ Lift Platforms. Nichole’s internship has been extended through the fall semester. * Stephanie Wood, a summer 2016 graduate with a financial management major and international business minor, worked as an intern at TEGAM, Inc., in Geneva, Ohio. TEGAM, Inc. specializes in the design, manufacture and support of a wide variety of test, measurement and calibration instruments with technical representatives and distributors in over 40 countries. Wood has accepted a full-time job with TEGAM as a result of her performance during the internship. * Tiffani Pike, a senior financial management major and a minor in international business, worked with Gia Russa (Summer Garden Food Manufacturing) in Boardman, Ohio. Gia Russa is the maker of the world’s most sought after pasta sauces and Italian specialties. * Yana Flider, a senior international business major, was employed with Blackwood Pet Food, LLC, a globally recognized developer and brand of pet food in Lisbon, Ohio. Blackwood Pet Food works exclusively with independent pet stores and online distributors. Blackwood Food extended Yana’s internship through the fall semester. * Briana Scott, a senior accounting major, worked with Rain Drop Products, LLC, Ashland, Ohio. Rain Drop Products transforms imagination into new dimensions in water play with dynamic custom designed water parks that deliver adventure, visual excitement and imaginative fun. Rain Drop Products offers a full line of water play equipment including above ground and below ground spray ground/splash park features, slides and structures. * Michael Osborn, a senior international business major at the University of Akron, worked as an intern at Cox-Colvin & Associates in Plain City, Ohio. Cox-Colvin & Associates provides experienced and capable project teams, high-quality work products, solution oriented approaches, and the creative use of technologies to their customers in the environmental industry. * Michael Steensen, a senior international business major at the University of Akron, was employed at LF Star Incorporated in Twinsburg, Ohio. L.J. Star Incorporated manufactures and provides an extensive line of process observation equipment — sight glasses, lights, sanitary fittings, and level gage instrumentation. The YSU Williamson College of Business Administration and the OSU Fisher School of Business are the only two Ohio public universities to offer the program. Recently, the Ohio Export Internship Program won the President’s E-Award, the highest recognition any U.S. organization can receive for its contribution to the expansion of U.S. exports. For more information on the Ohio Export Program, contact Kassis at YSU at 330-941-2415 or mhkassis@ysu.edu.